The Iran-backed Houthi militias have placed new obstacles in the ongoing efforts to hold a prisoner exchange with the legitimate government. 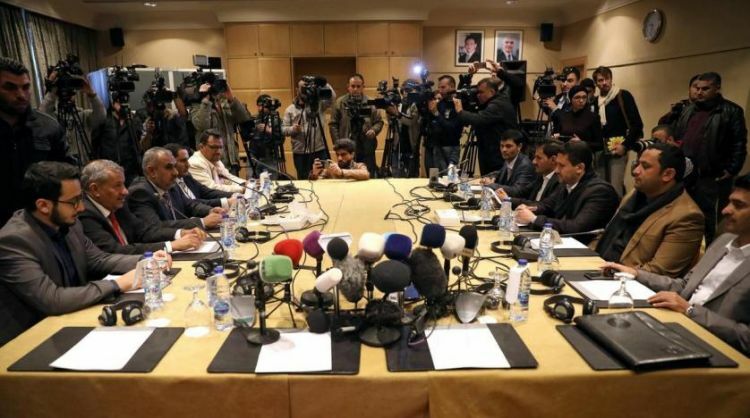 The warring parties in Yemen held in Amman on Tuesday a new round of talks over the prisoner swap. The meeting was attended by United Nations envoy to Yemen Marin Griffiths, International Committee of the Red Cross President Peter Maurier and representatives from the government and Houthis. The Houthis on Tuesday proposed that the swap take place in phases, with 200 being exchanged in the first stage. The government demanded that the militias reveal the names of the detainees it is holding, which is estimated at some 1,300. Asharq Al-Awsat learned that Griffiths was informed of the Houthi proposal, but will not comment on it until the three-day Amman talks conclude. The Houthis have already showed signs that they are unwilling to commit to the swap deal, which was agreed to in Sweden in December as part of a greater ceasefire deal on Hodeidah city and its three ports. The militias had delayed in presenting comments on government-submitted testimonies on the Houthi list of prisoners. The government had complained of the militias’ stalling to Griffiths. Yemeni Foreign Minister Khaled al-Yamani had predicted to Asharq Al-Awsat Monday that the Houthis would resort to stalling in order to prolong the prisoner discussions. Yemeni Minister of Human Rights Majed Fadel told Asharq Al-Awsat that the government rejected the Houthis’ prisoner swap proposal Tuesday. “It contradicts the agreements we had previously reached,” he said. “Why don’t they release all of the prisoners who have been proven to be held in their jails?” he wondered. He accused the Houthis of reneging on agreement reached during the first round of prisoner swap talks that were held in Jordan in January. “This is how the Houthis operate. They rely on stalling and we have seen this in the implementation of the Hodeidah agreement and others,” Fadel stressed. "Success in this regard is not only of huge importance for those who will be released and return to their families but also to the broader political process in which we are engaged."